With fall comes an abundance of apples which is a perfect excuse to make dehydrated spiced apples. 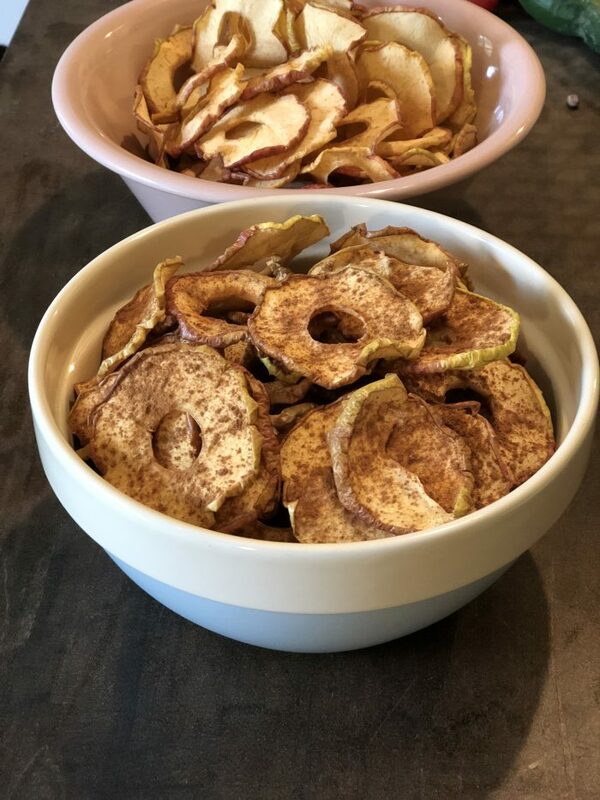 These apple chips are great plain, but I’m also going to show you how to spice them up a bit (using dried spices or essential oils) to make them even better! Dehydrated spiced apples are one of nature’s perfect (healthy) candies. And they’re addictive…but they’re also easy to make so eat away! I will be the first to admit, I’m one of ‘those’–the pumpkin spice lovers that even eat pumpkin spice out of season (GASP). Because of that, I don’t know why it took me so very long to think about making dehydrated spiced apples! Adding a bit of cinnamon, ginger and cloves gives the dried apples a hint of pumpkin spice and knocks the flavor up a few notches. I made pumpkin spice apples using traditional powdered spices. Then I decided to try it using essential oils. The oils took me a bit of trial and error, but I eventually got a great system down. I prefer the apples using the oils because the flavor penetrates the apple slices more deeply and isn’t just a powdered coating on top. However, both ways are fabulous and I’ll be making my apple chips this way from now on! An apple corer is handy, but you could make them without one (I use this simple one here). I also have the kind that peels and cores at the same time (like this), but for dehydrated apples, I like to leave the peel on. Cinnamon, ginger and clove essential oils (ONLY use oils that are pure and have a nutritional label that states they can be ingested) These are the ones I use. If using essential oils, I found a tiny squirt bottle really handy in applying the oils to the apples. First, wash your apples. 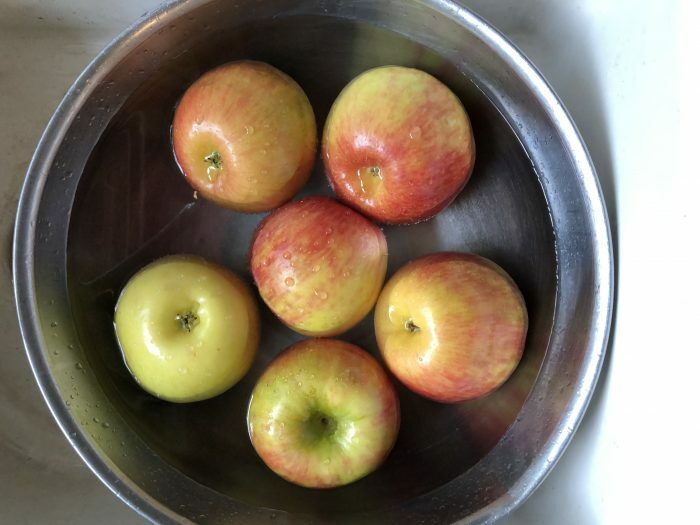 Because the apples I used this year (mostly) came from the store, I washed them in a bowl of water with a couple drops of lemon essential oil added to the water. Lemon is a great detox oil and will strip the apples of nasty chemicals as well as wax residue or other things you won’t want to ingest. 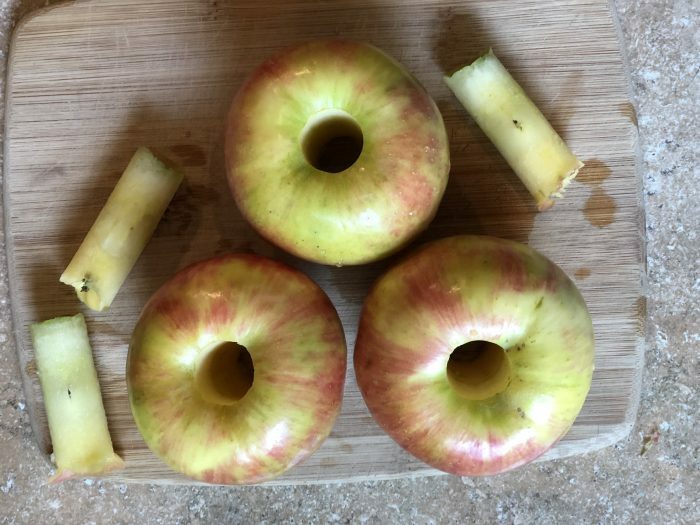 Next, if you have an apple corer, core your apples. 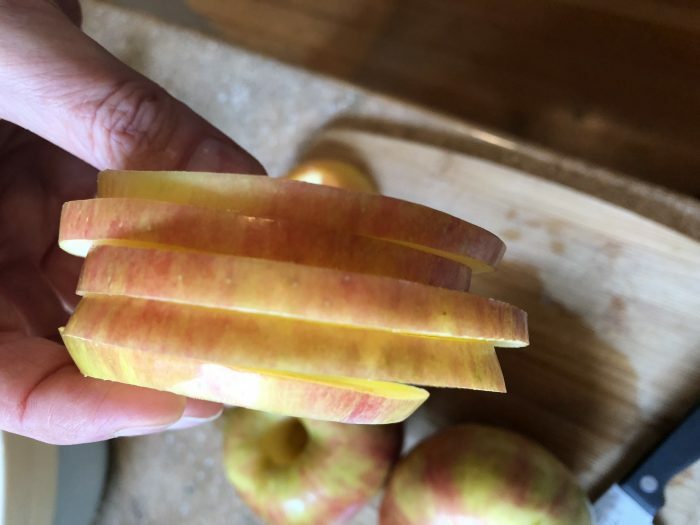 If you don’t, you can leave the cores in (they don’t taste bad dehydrated), you can cut them out of each slice as you go, or you can quarter the apples, remove the core and slice them up that way. Step three is to slice the apples about a fourth inch wide. The biggest key here is to make them as even as possible so they’ll dry to the same done-ness uniformly. 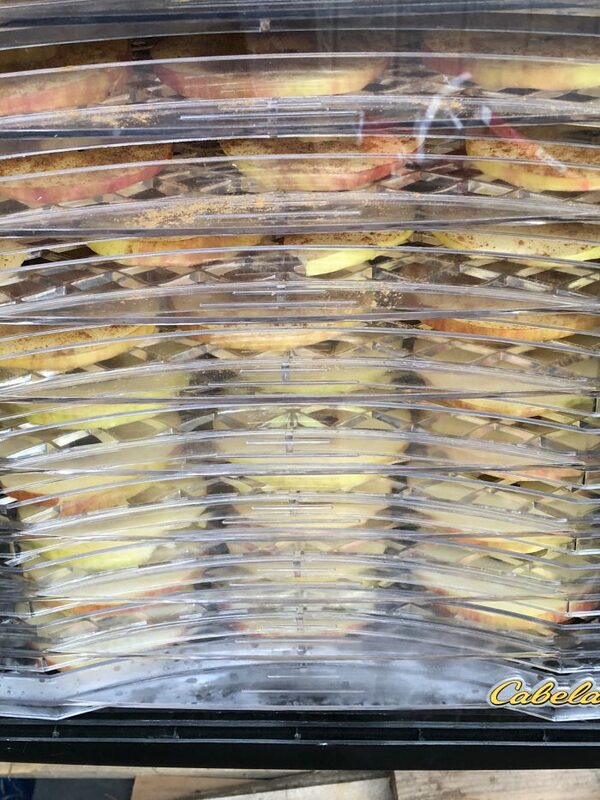 Line the apple slices on a dehydrator tray, making sure they don’t touch. Sprinkle the spices on the slices–use more than you think you should, as they won’t taste as strong when they’re done as you would expect. Place in the dehydrator and cook according to your dehydrator’s directions. (I cooked mine at 145 degrees for around 15 hours–but I also live in a damp environment and my apples were big juicy ones). You want them to come out bendable and kind of leather-like in texture. Some apple chips might dry faster than others, so pull out the done ones and keep cooking the others until they’re all done. Just the smell is almost a good enough reason to make these. Ah. So. Good! On my first experiment, I started by adding my apple slices to a bowl of water. I then added the oils to the water and swished it all around a few times (because oil and water don’t mix well on their own). I left this mixture to sit for 10 minutes or so, swirling occasionally before removing them from the bowl and finishing the process as above. The results weren’t super great. First, my apples took longer to dry after they’d been soaked for so long in water. Second, while the oil flavor was there, it wasn’t very uniform. One bite might have a spice, the next one, none (despite my swirling!). I then tried adding the oils to a small spray bottle (Actually, I have little spray nozzles that fit on oil bottles, so I used an empty bottle and put a nozzle on it–but any small spray bottle should work). I used a ratio of 5 drops of cinnamon to 2 drops of ginger and 1 drop of clove and filled my tiny 5mL bottle about half full. At first I tried the oils full strength and sprayed them on. WOW! The flavor almost knocked me over! The second time, I added one-third to one-half ratio of water to the oils and it was perfect. Shake and spray (as the oil and water won’t mix together on their own). The oils permeated the apples clear through. They were uniformly flavored but not overpowering. JUST RIGHT! My official verdict at the end of all this experimentation was the using diluted essential oils made the apples taste fresher and spicier. My definite favorite way for sure. Lastly, if you don’t have a dehydrator, you CAN make these in your oven. Follow whichever method above you prefer. 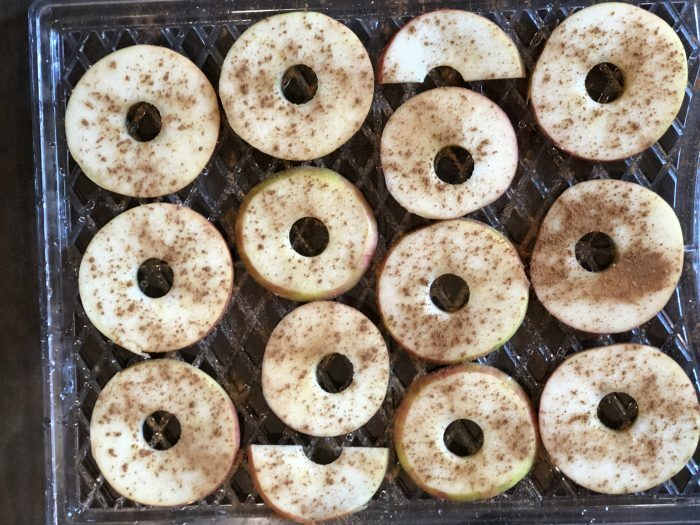 Instead of sticking the apple slices on a dehydrator tray, arrange them on baking cooling racks (or even directly on the oven racks) and stick them in the oven. Set your oven at the lowest temperature (Mine only goes down to 170 degrees, but if you can get it down to 150, it’s even better). Again, bake time varies depending on where you live (and the humidity), the kinds of apples you’re using (and their moisture content) and how your oven works. But expect it to take between 5 to 6 hours. After they’ve been in there for a while, check on them to see how they’re doing (this is an excuse to taste test). Again, they should be leathery, but still bendable when they’re done. No matter which way you make them, dehydrated apples spiced with pumpkin spice seasonings is a win in my books. If you’re a pumpkin spice fan like me, I think you’ll love them. Mmmmm. This post contains affiliate links–if you click on the link and make a purchase, I get a few cents. This doesn’t cost you any extra. Thanks for helping to support this blog.